Getting Creative with the console API — If console.log is as far as your knowledge of the console object goes, this could be very handy. There are so many useful functions in there that’ll help you out while debugging. SQL, Python, and R. All in One Platform. 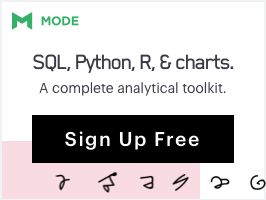 Free Forever — Mode Studio combines a SQL editor, Python & R notebooks, and visualization builder in one platform. Connect data from anywhere and analyze with your preferred language. Custom viz (D3.js, HTML/CSS) or use out-of-the-box charts. 'Make It Hard to Screw Up'-Driven Development — Great points from Chris Coyier here. “We’ll always be screwing up code, but we can also always be finding ways not to.” Those ways include leaning on tools like linters and JSX, and even your co-workers. Web Components Will Replace Your Frontend Framework — A bold claim but Danny makes a lot of good points and shows off the basic concepts well. Understanding Event Emitters — Ever written your own event emitter from scratch? They can come in handy quite often and this is a neat introduction. A Basic 3 Step Functional JS Example — If ‘functional programming’ seems above you, these are the simplest, basic examples of a few of the concepts that you can get. Codelyzer: An In-Browser TypeScript and Angular Code Checker — The creator introduces what this is about in this talk. PreVue: A Prototyping Tool for Vue.js Developers — Built in Electron (so Mac, Linux and Windows builds are available), this is a tool for prototyping Vue.js components. GitHub repo. Aurelia Unveils Its Web Components Plugin — This is interesting because it lets you use Aurelia custom elements as Web Component elements enabling interoperability with other frameworks. Node's Popular request Module is Going into Maintenance Mode — request is a long standing Node module for making HTTP requests, but it’s going into deep freeze to make way for alternative, more modern options. Formal: React Form Management Primitives for the Hooks Era — Formal provides a variety of primitives to help you manage your forms’ state & validations. is-online: Check If The Internet Connection Is Up — Works in both Node.js and the browser. Uses Apple’s public captive detection page behind the scenes. React Native CarPlay: Build CarPlay Apps using React Native? — It’s at an early stage but an interesting idea if you have a car that supports Apple CarPlay.